In a large, heavy-bottomed saucepan over medium heat, melt butter. Stir in flour to make a roux and cook about 5 minutes, stirring frequently. In a separate saucepan, bring cream to a simmer. Slowly pour hot cream into roux, whisking constantly. Cook for 5 minutes or until thickened, whisking frequently. Add cheeses and cayenne; season with salt and pepper. Cook over low heat until cheeses melt to a smooth consistency, whisking frequently to prevent scorching. Remove from heat and keep warm. 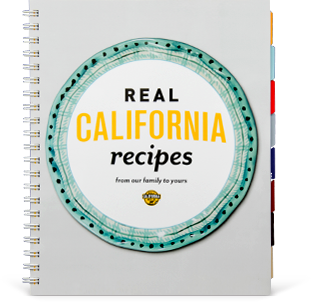 Cook macaroni in 4 gallons heavily salted boiling water for 2 minutes less than package directions state. Drain and rinse with cold water; drain well. Fold macaroni into warm cheese sauce and cook over low heat, stirring constantly with a wooden spoon or heat-resistant spatula, until macaroni is tender. Coat a shallow hotel pan lightly with cooking spray; pour mixture into pan and spread in an even layer. Refrigerate, covered, until firm. Cut around the edge of the pan to release macaroni. Unmold onto a cutting board; cut into 1 1/2-inch cubes. 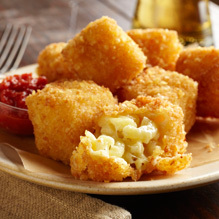 For each serving, to order, deep-fry 3 macaroni cubes in 350°F oil about 4 minutes or until crust is golden brown. Drain on paper towel and sprinkle with salt. Serve with 1/4 cup Spicy Tomato Jam.